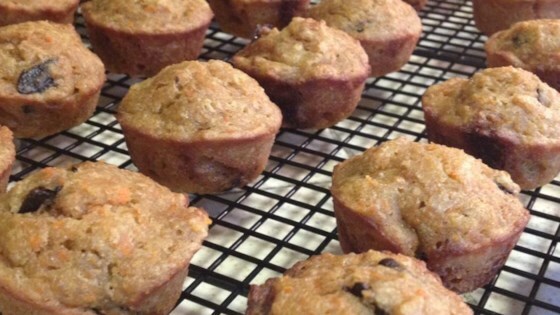 "I searched high and low for the right muffin recipe for my 9-month-old that used common ingredients. Couldn't find it, so I tweaked five or six different recipes and came up with this one!" Preheat the oven to 375 degrees F (190 degrees C). Grease 12 muffin cups with 2 teaspoons coconut oil. Soak raisins in warm water in a small bowl until rehydrated, about 10 minutes; drain. Chop raisins. Beat 1/4 cup coconut oil, butter, and brown sugar together in a bowl. Add eggs, mashed bananas, applesauce, and grated carrot; beat to incorporate. Gently fold bread flour, whole-wheat flour, flax seed, chopped raisins, baking soda, salt, and vanilla extract into the banana mixture using a rubber spatula; pour into prepared muffin cups. Bake in the preheated oven until a toothpick inserted into the center comes out clean, about 18 minutes. Cool in the pans for 10 minutes before removing to cool completely on a wire rack. WOW! What a great muffin recipe! Very moist and tasty. The only change I made was using dark chocolate covered raisins and not soaking them in water. We will definitely have this again. Thanks. These muffins were fairly gross. They came out soggy and didn't rise as much as would be expected. I would not recommend making them and my whole family loves muffins! Awesome, moist muffins that my kids loved. I added blueberries to half and that was even better.